Hey I made a card of you for the 'make your favorite cardsmith' contest. I hope you enjoy it! I thought the idea fit your current Porg fever lol. KrampisZman, if your interested i have a contest thats coming to a close by the end of this month for cardsmiths' take on already existing planeswalkers. The catch really is to come up with artwork of planeswalkers not having been used on actual magic the gathering cards. The abilities of the loyalty counters are all to your discretion. It'd be fun to see what you come up with, I enjoyed your porg contest and look forward to making more cards for future contests for you! (ps my names corey, on here im sorinjace, my friend john im sure hed want to say hi hes dechujoh64 hes a good friend of mine). well hope to hear from you. take care and good cardsmithing! 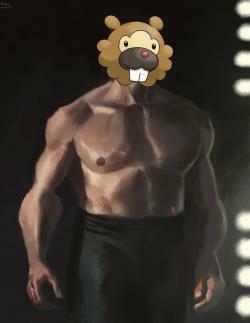 Krampiszman decided to declare to the world that he has an undying love of Bidoof. Most of you already knew that.